In recent comments submitted to EPA, University of Alabama in Huntsville atmospheric scientist John Christy challenges the physical science basis of the agency’s Clean Power Plan. 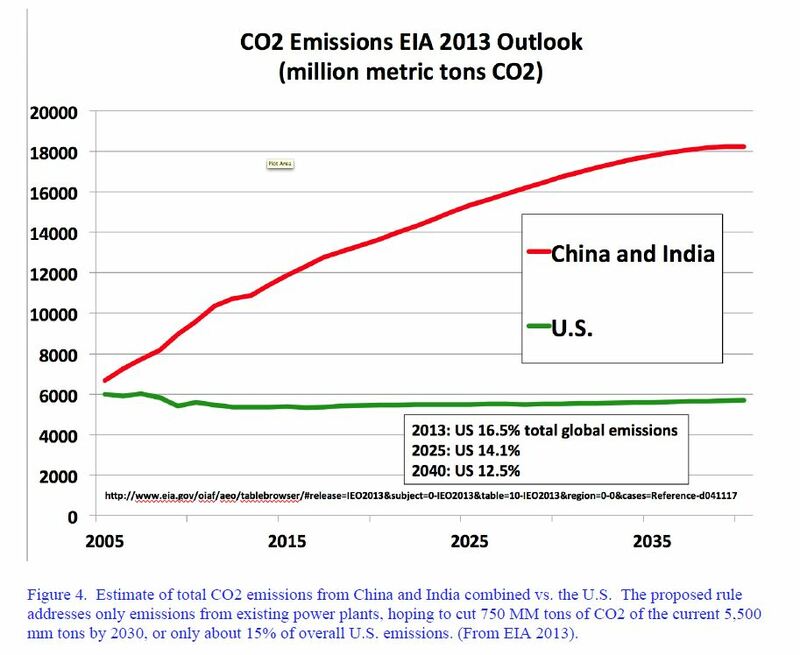 EPA assumes that anthropogenic emissions of greenhouse gases, especially carbon dioxide (CO2) from energy use, are the driving force behind recent climate change. It thus further assumes that regulating CO2 emissions can mitigate future climate change, providing substantial health benefits to the American people. Christy does not dispute the reality of climate change. The climate is always changing on multiple time scales. However, the Earth has experienced climatic “fluctuations in the past centuries similar to and even greater than what has occurred in the past 50 years.” Scientific instruments measure what the climate is doing; they don’t tell us why it behaves as it does. To understand what drives climate change, scientists must test hypotheses against data. 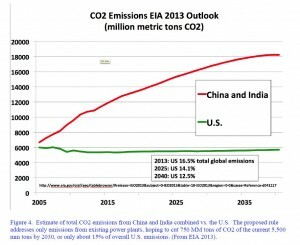 EPA assumes CO2 emissions are the chief driver because that’s what state-of-the-art IPCC climate models assume. 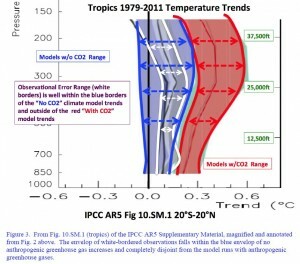 But, Christy points out, data from six independent global temperature monitoring systems “demonstrate that the models do not yet have the ability to discern ‘why’ a climate variation may have occurred simply because they cannot even reproduce ‘what’ has occurred.” The chart below compares climate model projections with observed temperatures over 35 years in the tropical troposphere, the portion of the atmosphere where models project a “highly consistent and significant” warming response to rising CO2 concentrations. 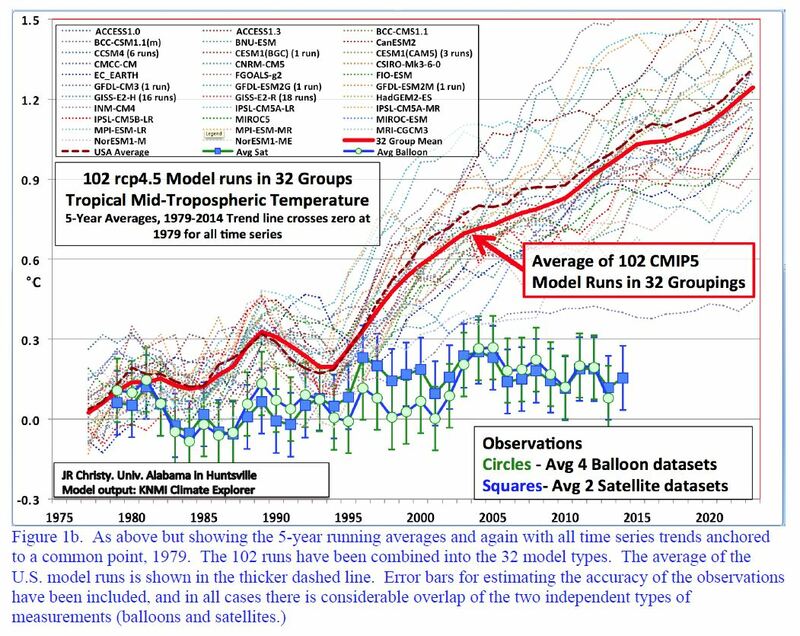 Here is the same comparison of model projections vs. observations but shown in five-year running averages rather than linear trends, and for 32 model ensembles rather than individual models. 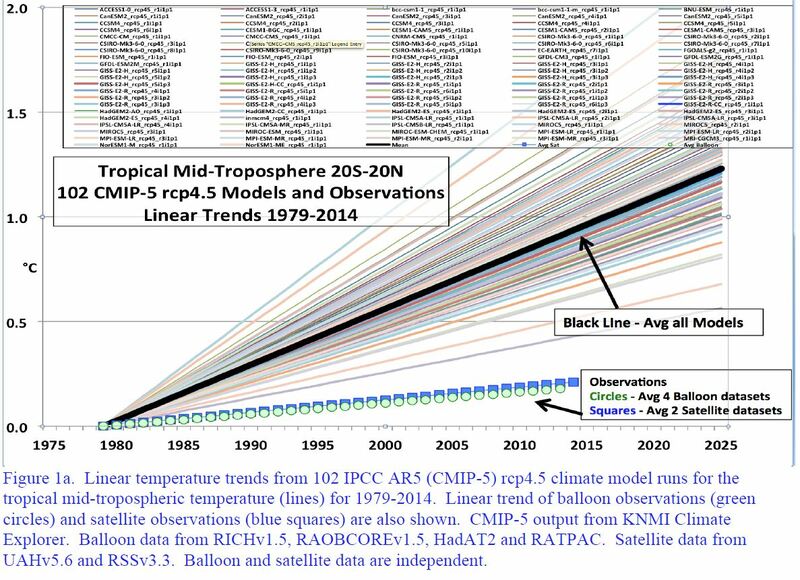 The dashed red line depicts the average projection of U.S. climate models. 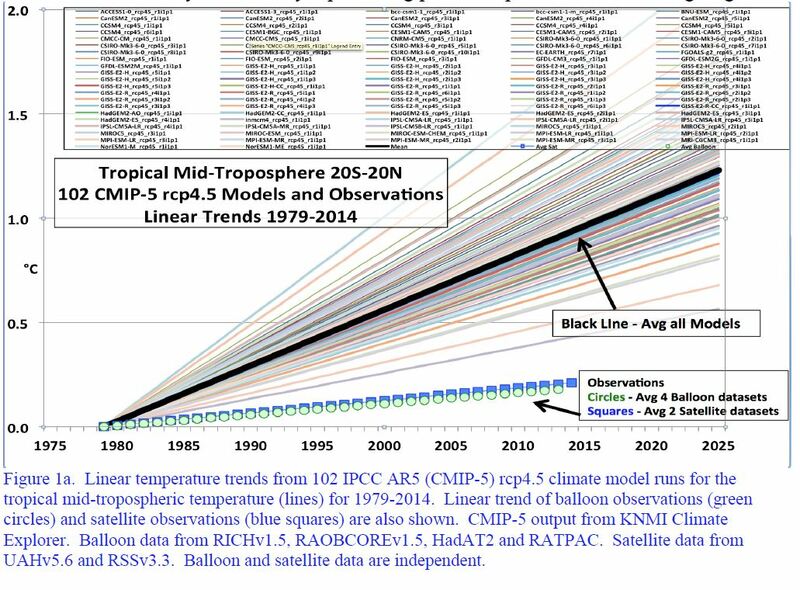 To demonstrate that point, Christy magnifies part of a chart ‘buried without comment’ in IPCC supplementary material. 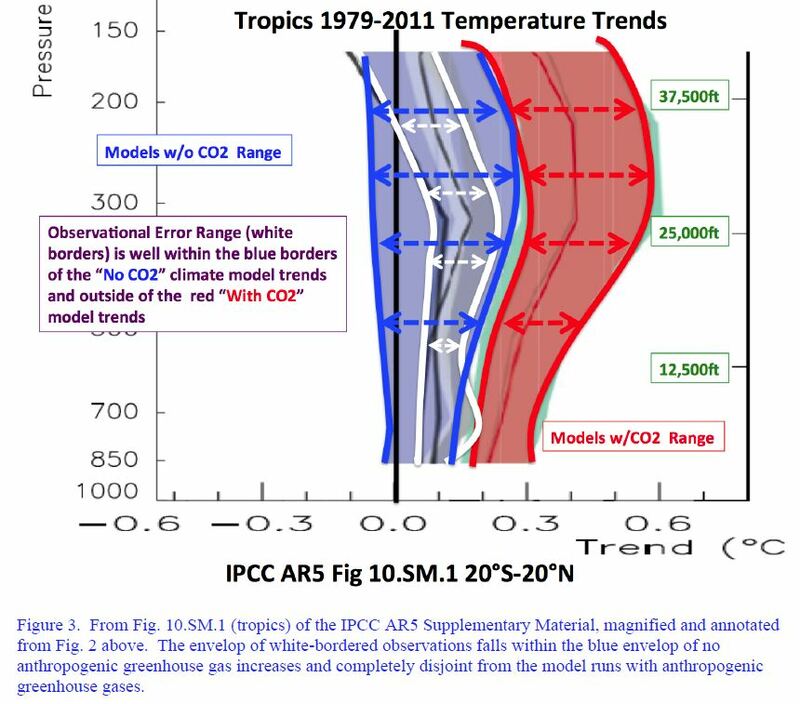 The area bounded by the white lines, which depicts the range of temperature observations during 1979-2011, falls within the blue area, which depicts the range of climate simulations from models run with “natural forcings” only (i.e. with no extra anthropogenic forcing). 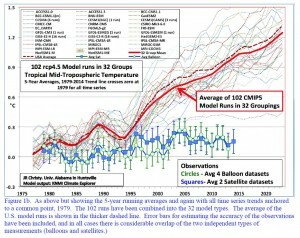 Thus, it is possible that all the warming since the start of the satellite record is due to natural variability. Christy draws out the obvious policy implications. Thus, we should have little confidence that the future will play out as the models suggest. . . .The EPA cannot conclude it knows “why” the climate system changes and thus cannot assert it will control “what” the climate will do . . . The direct, measureable impact of CO2 emission reductions on public health due to climate change mitigation will be zero. Because the rule has no discernible efficacy regarding the impact of CO2 on climate, there is no rational basis to insist it be adopted. Jeeee Whiz…. 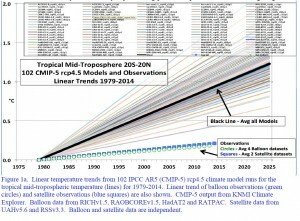 IT’S almost like the “radiative Greenhouse Effect” has no influence on the average temperature of the Earth, “WHO KNEW”…. A bunch of engineers have been saying this for years, good to hear that the scientists have finally “come up to speed”…. Ninny’s that think they can control the “climate” of the Earth should start by going back to a trade school and learn some HVAC skills. Heck it’s difficult enough to make your house “toasty” inside in the winter and “comfy” inside in the summer. Only an over educated DOLT would think they can do it for the entire PLANET by controlling the amount of a miniscule (thermal capacity wise) TRACE gas. The trouble is the behemoth that is the Global Warming Industry has achieved such momentum that mere facts will not stop it. The EPA encapsulates all that is “felt” by the emotional and cynical bed wetters who wish to use AGW to achieve whatever their ends might be. Politicians, activist scientists, environmentalists, anarchists, socialists, anti-corporatists, back to nature hippies all find something useful in AGW. The facts laid out by Dr Christie will be stumbled upon by the believers but they will pick themselves up and scurry along as if nothing has happened. The media will be there, as always, to help them. It should be clear that neither Kyoto nor the IPCC factored into their conclusions that fossil fuels are burned for their heat content and that the heat emissions alone exceed by more than four times, the amount of energy that can be accounted for by the rise in atmospheric temperature. CO2 is a minor factor that should not be subject to taxation, cap-and-trade, and certainly no credit given for its removal and storage. The latter is totally unfeasible. To reduce the CO2 concentration by 1 ppm requires the removal of 9 billion tons and does not put the heat released “back in the bottle”. How much CO2 must be removed to arrive at a “safe” level? Some companies and other countries want compensation for the CO2 that is captured. This is folly and just a diversion to delay the implementation of renewable energy sources, reliability of which can be greatly expanded by batteries, and at less than the astronomical costs that will accrue if compensation for CO2 removal is close to the price of taxes that are being considered for CO2 emission. One subtlety: The models probably didn’t produce the results shown naturally. 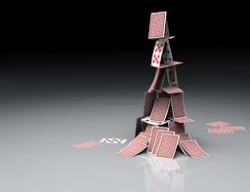 Imagine the modelers, with the installed catastrophic theory firmly mounted in their heads. They do a model run, based on the original setup, and it shows no significant effects. You know they will change the system, the parameters, and the inputs until it produces “appropriately” catastrophic results, and only that version and those runs get published. A log of every model run would be revealing indeed. Previous post: If Ultra-Troubled Ivanpah Is “2014 Renewable Energy Project of the Year,” Then How Bad Off Is the Green Energy Industry?